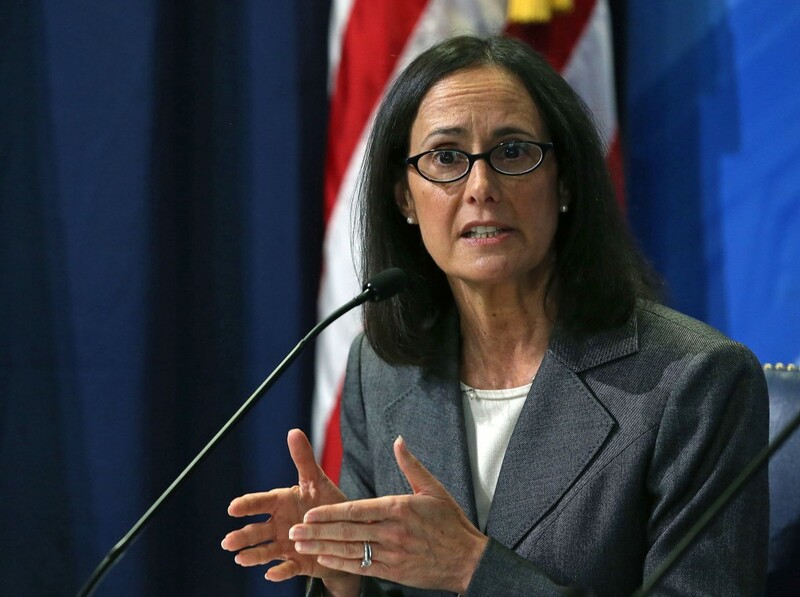 Lisa Madigan of Illinois is the nation’s longest-serving woman state attorney general — and the Democrat has endured as the top legal officer in a state with deep budget troubles and a long-standing reputation for corruption. There have been tough moves and political hardball during Madigan’s 13 years in the role and plenty of criticism. She thwarted a 2004 casino deal in suburban Chicago over alleged mob links to the gaming license. She pressed a 2008 case to remove from office then-Gov. Rod Blagojevich, a Democrat who later was convicted of corruption charges. In the past year, Madigan called for a federal civil rights probe into the Chicago police despite the objections of Rahm Emanuel, that city’s mayor and former White House chief of staff to President Barack Obama. And Republican Gov. Bruce Rauner has accused her of teaming up with her politically powerful father, Illinois Speaker of the House Michael Madigan, in a political and legal showdown over the state’s budget. Through it all, Madigan has built a track record of success as a proactive attorney general when it comes to consumer protections in her state and nationwide — a foundation to pursue the bigger political ambitions that many suspect are in her career plans. “It probably can take me anywhere I want to be, but I have to be honest, being attorney general is a great job,” Madigan said in an interview with CQ Roll Call. “I went to law school to help people. I’ve always wanted to be an advocate. Being attorney general has truly allowed me to be a voice for justice for the people of Illinois and oftentimes the country — and I love it,” she said. Yet for all of her office’s achievements on the consumer protection front, she has taken some dings from the Chicago Tribune editorial board and other commentators for not doing enough to bust the state’s political corruption. She says Illinois law, before her time, took away the power of her office to tackle those issues. Her office, she has noted, can’t empanel a grand jury. Critics push back, noting that she accused her predecessor of being soft on corruption, and recalling that she did go after Blagojevich and other corrupt pols earlier in her tenure. None of that has seriously harmed her popularity in the state. Madigan’s job approval remains very high, said David Yepsen, director of a public policy institute at Southern Illinois University, Carbondale. She surprised many by passing on a run for the Illinois governorship in 2014, not because she couldn’t win but because she said it would be a conflict of interest to serve while her father ran the state’s legislature. Even as far back as 2008, the New York Times mentioned Madigan in a story about which woman could be the first in the White House. For now, the 49-year-old Loyola University Chicago Law School graduate is Illinois’ attorney general until 2018. There are about 375 lawyers in her office, which she says she has always viewed as the state’s largest public interest law firm. It has one of the largest and active consumer protection divisions of any attorney general’s office in the country, fielding about 200,000 people reaching out with problems each year. On that front, the Chicago Tribune has called her “fearless.” She took an active role against the country’s biggest mortgage lenders in the wake of the housing market downturn and helped to net dozens of settlements, such as leading a lawsuit against Countrywide’s predatory lending practices that resulted in a landmark $8.7 billion nationwide settlement in 2008. Madigan’s focus has turned now to stopping abuses and scams in the student loan industry. She leads a multi-state investigation into student loan provider Sallie Mae, now called Navient Corp., and was the first state attorney general to file lawsuits against companies she says are targeting the nearly 40 million Americans with $1.2 trillion in outstanding student debt. Todd Ruger is a legal affairs Staff Writer at CQ Roll Call. Contact him at ToddRuger@cqrollcall.com and follow him on Twitter @ToddRuger.